﻿ How to say I’m not sure in Chinese? Chinese Slang is my favorite thing to teach because there is so much meaning contained in the phrases. This week I taught my students two Chinese slang phrases because they contain the same word/character in them. That character is: 底 (Dǐ). 底 (Dǐ): bottom, underneath, underside. You will find this in the first phrase at the very end of it. When you’re first learning a new language there is one thing you are always absolutely sure of: You’re not sure. Trying to remember a word? Still not sure? That is most of my beginner students most of the time in class. Don’t worry, you’re not the only one! A lot of us are unsure about a lot of things in life. So if you can learn how to say this word in Mandarin you are able to communicate a lot about what you’re feeling. 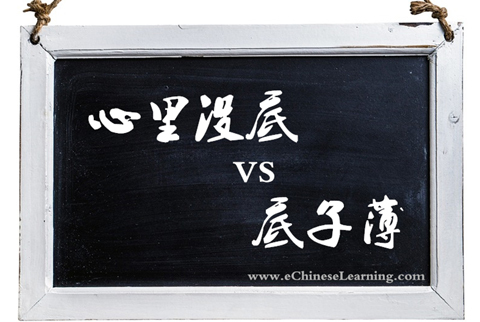 心里没底 (Xīn lǐ méi dǐ): not sure. 心里 (Xīn lǐ): in the heart; at heart; in (the) mind. 没 (Méi): not, have not. That is a distinct feeling in life, whether you are learning a language, or perhaps are not sure of your feelings for another person. Either way, it is hard to find that bottom line in your mind and heart! Kǎoshì jiéshù le, dànshì néng bù néng tōngguò, wǒ xīn lǐ méi dǐ. The exam is over, but I’m not sure if I can pass it. Wǒ duì wǒ de gōngzuò lǎo shì xīnlǐ méi dǐ. I am always uncertain about my work. 底子薄 (Dǐzi báo): have a poor foundation to start with. 薄 (Báo): thin, weak, poor. Jack de yīngwén dǐzi báo. Jack has a poor foundation in English. Tom de shēntǐ dǐzi báo, zuò bù liǎo jùliè yùndòng. Tom has a poor foundation in his body, therefore he can’t do more difficult exercises. Because a Chinese word can hold many different meanings, it can be hard to recognize the correct conversational meaning when reading text, etc. Drawing inferences from context and other meanings within the sentence or paragraph is very useful. Make sure as you’re studying Chinese that you’re paying attention to the whole picture. Nǐ de bìyè lùnwén xiě de zěnme yàng le? Wǒ yǐjīng xiě wán le, dànshì xiě de hǎo bù hǎo, zhège wǒ xīnlǐ méi dǐ. A. Lily hasn’t finished her graduate thesis. B. Lily is not sure if she wrote a good graduate thesis. C. Lily is sure that she wrote a good graduate thesis.